Talking yesterday of being inspired by other gorgeous bloggers, the darling Fashion Chalet recently did a post on her Minnetonka collection. Wow, I was impressed!! They are made and sold mainly in the USA but I was very pleased to see there is a UK website-click on my title link to see!! I can't justify these beauties at the moment, but along with the black leather thrifted bomber jacket, these will be 2 purchases definitely for winter!! The only problem is, what style to have-well, I've a few months to save and chop and change my mind!! You know I love those things! Don't taunt me with them! I am waiting till someone wises up and puts a heel on one of those triple-fringed styles so I can wear them. very nice! I haven't played around much with fringe. Something I might try this fall. Which ones are you looking at getting? they are all Yummy Sharon. I know choosing will be hard,my faves are the last two! Now I want a pair! Hi Kate-yes, I was totally drawn in to Fashion Chalets collection!! Hi wendy-I'm sure it won't be too long before someone does!! Hi mikkle-I'm loving all 4-haha, but once I've the money then I'll make the decision! I might go for brown though! Hi marian-yes, I'm swaying towards these 2 as well, particularly the new ones in!! I love Minnetonkas, esp. that laceup front boot. they have that authentic look, i feel like they're classics. Hi fashion herald-yes you're so right, I will enjoy saving and debating over these, haha!! Hi krissy-yes, I love these ones too! Hi fashion chalet-yes, these last ones are great-that just makes my decision even harder!! Yay to the 80s too! Hi ellie-oh yes! You're so welcome my dear! i love these boots and am also seriously considering buying the tan version! Hi cupcakes and cashmere-yes, I'm really liking the 1st pair in tan, I think this colour will be more wearable in summer! Hi couturecarrie-yes, I want them!! Hi nadine-well for me, they will work in winter with skinny jeans and chunky cardis and in summer some vintage floral summer dresses-the more slouchy version is what I'm after!! 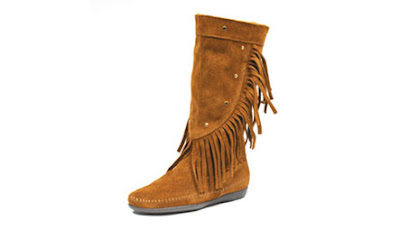 I adore the Triple layer fringe boot! i am not sure about fringe boots for me even though everyone is raving about them. the first ones are adorable! i looove my minnetonkas!!!! I like the fringe on them. Colder weather is coming, I better get myself a pair! I'd say go for the first one. Hi saray-yes, these ones are a great classic! Hi savvy-yes, not all trends are for everyone!! Hi toni alexis-yes, I'm swaying towards these too!! 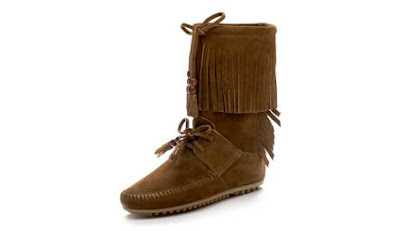 Hi asiancajuns-yes, I would like the 1st pair-ideally they are fringey and slouchy!! Hi anjeanette-yes, go for it!! Hi nay'chelle-yes, I reckon so too!! Hi cate-yes, these ones are gorgeous-what a dilemma, huh!! Hi angel-yes, I do so want some!! Oh, if only I could teleport you out here. 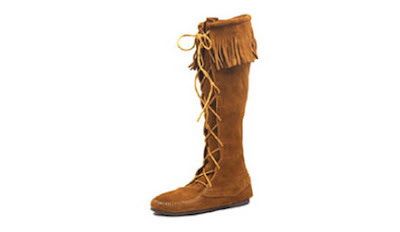 Saw some Steve Madden fringed boots at Marshall's over the weekend for $40! Hi Sal-haha, that would be great if I could!! The Steve Madden boots sound a great bargain!! I've always loved Minnetonkas. I can remember being a kid in the 70s and all of the really cool (read badass stoners) teens wore the lace up front boots. Hi always in style-yes, I'm coveting the 1st pair, but after your post, deliberation will be in order, haha!! Hi alicepleasance-yes, I think they're lovely! 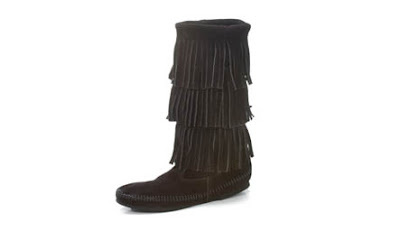 Loooooooove Minnetonka fringed boots! Although they might seem all boho, I think they're actually quite a classic style here in the States, as they've been around since the Hippie era. There's that famous photo of Kate Moss in a pair of denim shorts and black Minnetonka fringed boots! Tip: you should really shop around and find a place or website (like Bass Pro Shops, online) that sells Minnetonka at much cheaper prices than what you'd pay at a place like Urban Outfitters. At "trendy" sites like UO they hike the price up for brands like this *a lot*.